Benchmark Mineral Intelligence analyst Caspar Rawles shares his thoughts on the cobalt market in this interview from Cathodes 2017. At this year’s Cathodes conference, the Investing News Network caught up with Caspar Rawles, analyst at Benchmark Mineral Intelligence, to talk about the cobalt market and what’s ahead for the rest of 2017. The rally in the cobalt market seems to be unstoppable at this point, as the metal is a key element in the lithium-ion batteries used to power electric vehicles. 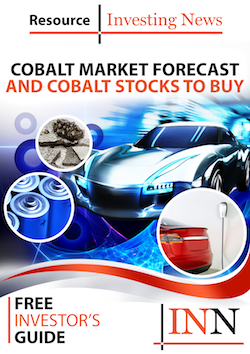 As electric car sales surge in the coming years, demand for cobalt is also expected to increase significantly. “I don’t think there are any factors that could derail the cobalt story at this point,” said Rawles. He also explained why he still believes the Democratic Republic of Congo is critical for supply and touched on the need for other countries to bring production into the market. Speaking about lithium-ion batteries, Rawles said he doesn’t expect any big shift in technology up to mid-2020 that could replace cobalt, although a change in the proportion used in batteries is still in the cards. Watch the video above to hear more about Rawles’ thoughts on the cobalt sector and what to expect in the near future. The transcript for this interview will be added shortly.